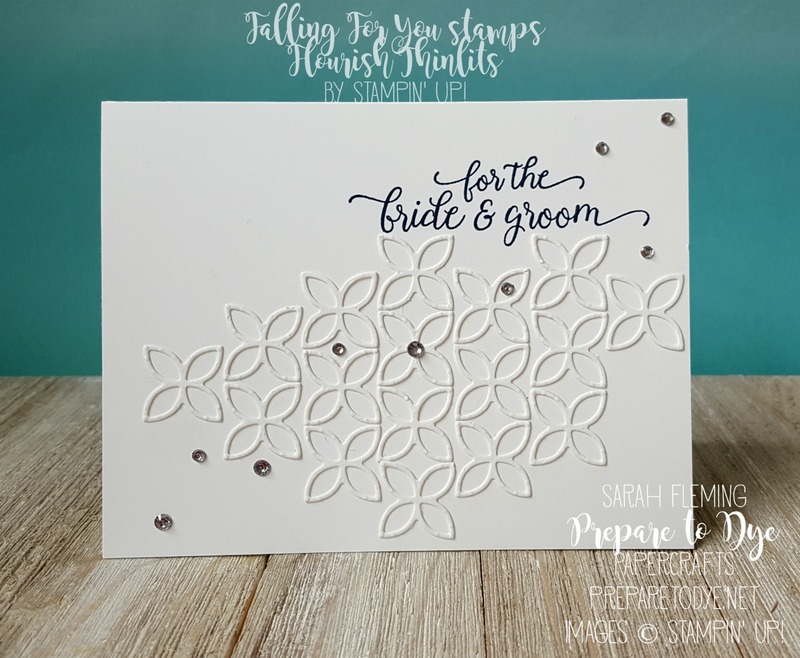 Hello, and welcome to the International Blog Highlights featuring only current Stampin’ Up! products! 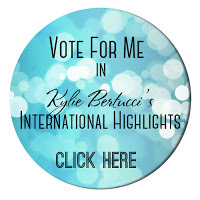 We are being highlighted by the lovely Kylie Bertucci, and you can VOTE for my project! The top ten winners will get to be part of an international blog hop, so please do vote for my card. Our theme for this highlight is Weddings. This is perfect timing, since June starts the big wedding season here in America. I decided to make a white-on-white clean-and-simple card. 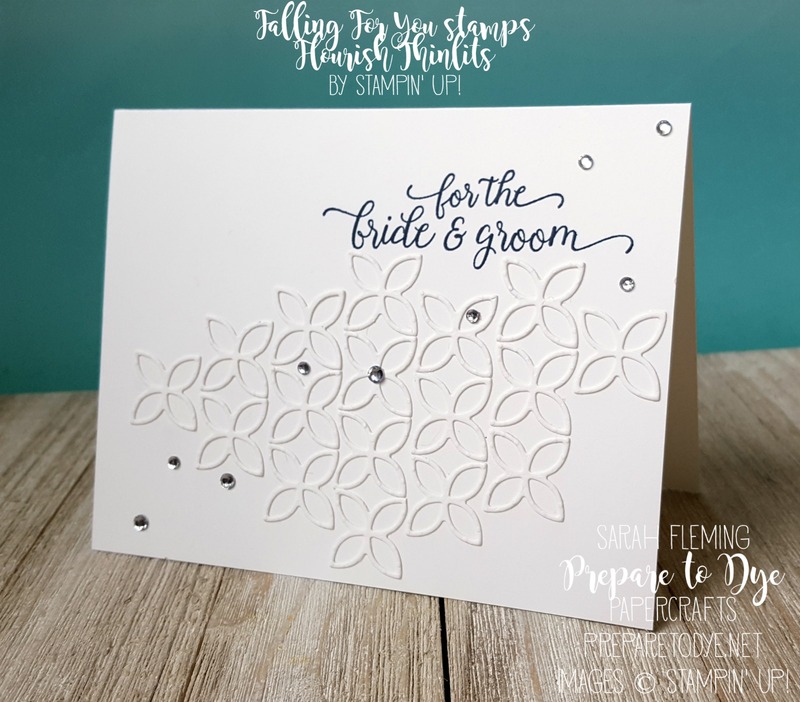 The little designs all over the card are cut using the Flourish Thinlits. I just got this set in this week and couldn’t wait to use it! I love how when you add die cuts that are the same color as the card base, it looks like you embossed one section of your card. I had planned to heat emboss the sentiment in silver, but when it came time to stamp it, I suddenly wanted Night of Navy instead. The sentiment is from the Falling For You stamp set, which is sadly retiring. It’s only guaranteed until May 22, and after that it will be *while supplies last*, so if you want this beautiful set, make sure to order it soon! And then, of course, I needed a spray of rhinestones. Everything is better with a spray of rhinestones. Thanks for stopping by today. Please head over to Kylie’s blog to VOTE for my card and see the other cards in the blog highlights. 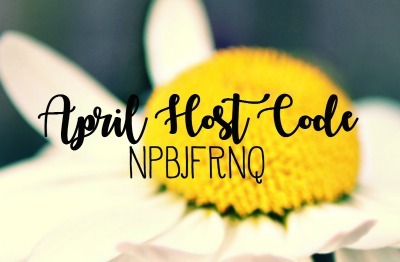 I’d love to take part in the next International Blog Hop!